Bidone is the second person tied to the case who has requested a plea bargain, after former AFI intelligence agent Rolando Barreiro became the first. The scandal surrounding an alleged illegal espionage network with deep roots in Argentina's Judiciary appeared to calm this week. However, the case is set to drag on for some time to come. A prosecutor in the city of Mercedes in Buenos Aires province, who was suspended for alleged involvement in the underground spy ring, on Thursday requested the court grant him a plea bargain. Meanwhile, in Congress the country's top spy chiefs addressed a closed-door hearing that addressed allegations spies in their agency were involved in the network. 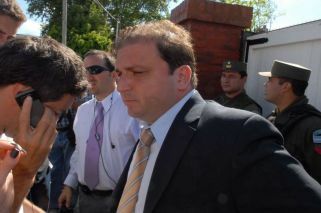 Juan Ignacio Bidone, federal prosecutor for the Mercedes jurisdiction, was summoned to appear in court Wednesday for having allegedly "provided access to sensitive information to people who are being investigated for being part of a criminal organisation". Bidone is the second person tied to the case who has requested a plea bargain, after former AFI spy Rolando Barreiro became the first. Investigating Judge Alejo Ramos Padilla on Thursday suggested there was nothing to stop Barreiro from securing a plea bargain, though the prosecution has warned the Dolores court faces losing its jurisdictions over the matter if the former agent breaks confidentiality norms. The investigation is under the watch of Ramos Padilla and Federal Prosecutor Juan Pablo Curi, both of whom must give their respective approval for the plea bargains to take effect. Bidone is among a group of people, including Clarínnewspaper journalist Daniel Santoro, who claimed to have been "tricked" by the phoney lawyer Marcelo D'Alessio, the accused mastermind of the illegal espionage ring which allegedly involved journalists, prosecutors (including high-profile Carlos Stornelli) and even the US Drug Enforcement Administration. Bidone's name was mentioned, along with National Security Secretary Eugenio Burazco's, in a voice message obtained by the court in which D'Alessio can be heard complaining about how Bidone owned him money. "I became friends with him after 2009 and we began doing things together. I gave him some jobs, which means I fabricated some investigations so he could look good (as a prosecutor). We have a good relationship. He came to have a drink at my house", D'Alessio says in the voice message, according to court documents. Bidone last week denied having committed a crime in cahoots with D'Alessio, insisting he was convinced that the phoney lawyer was an "intelligence agent". "I always thought Marcelo D'Alessio was an intelligence agent who was collaborating honestly with the Mercedes Prosecutor's Office which I lead. I was tricked", Bidone said. "I have no doubts Marcelo D'Alessio is connected to the intelligence services because of the quality and quantity of sensitive information he handles and the relationships he kept", he added. Also on Thursday, the heads of the country's AFI intelligence agency appeared in a joint Congressional committee on intelligence matters. Gustavo Arribas and Silvia Majdalani met with parliamentarians from midday in a closed-door meeting presided by Radical Senator Juan Carlos Marino. According to sources, the meeting addressed several issues but focused acutely on Ramos Padilla's investigation into the alleged illegal spy network. Part of Ramos Padilla's case looks at possible AFI involvement, which AFI denies. The judge has not provided concrete evidence to date, warned Cambiemos (Let's Change) lawmaker Daniel Lipovetzky, according to media reports.